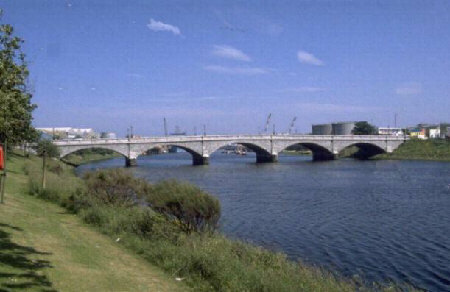 This is a picture of the Victoria Bridge which spans the River Dee at Torry. Victoria Bridge was completed in 1881 after an accident in 1876. The necessity of building a new bridge downstream of the Wellington Suspension Bridge was precipitated during the April Holiday of 1876, when 32 people returning from a day trip to the beach at the Bay of Nigg were drowned on the overcrowded ferryboat at the Craiglug crossing. The new bridge was designed by Edward Blyth.